| We are here, and here we are. We are here, and here we are. 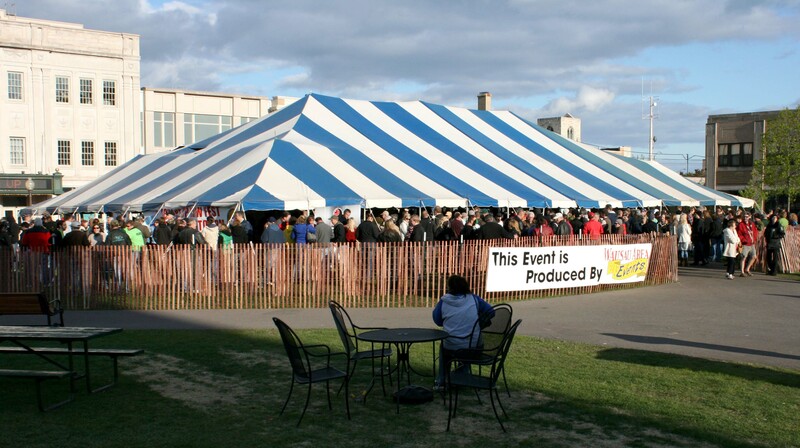 Despite heavy snow from a storm Friday night that collapsed the 60X100-foot tent over the performance stage, the SquareUp Brew Fest fund raiser started under clearing skies only 30 minutes late and hosted hundreds from Noon to 8:00 May 8, 2010. The people who attended – diverse in age and interest; families, individuals and groups – contributed $15,000 to the SquareUp Campaign to enhance the one-of-a-kind City Square in the Wausau’s central business district. SquareUp Brew Fest was sponsored by Wausau Area Events on behalf of the SquareUp Committee. Wausau Area Events volunteers staffed the ticket sales, beer serving and ongoing site operation services. WSAW News Channel 7 sponsored Brew Fest television promotions. Creative Communications designed the poster and event program. Sun Printing provided posters and SquareUp fund raising materials. Midwest Communications provided radio and the Daily Herald and City Pages provided print promotions. Twelve area businesses contributed services and materials for free or at discounted rates. Downtown businesses helped promote the event with their customers. Stevens Point Tents responded early Saturday morning to repair and re-erect the tent. A group of some 30 volunteers answered the call and helped with the tent and to set up the site. The City of Wausau Department of Public Works provided site preparation and take-down services. Brew Fest goers sampled three unique SquareUp beers that were donated by Bull Falls Brewery, Great Dane Pub and Brewing Co., and Red Eye Brewing Co.
A good deal of chatter among those attending was whether Bull Falls’ SquareUp 400, Great Dane’s SquareUp Springbok, or Red Eye’s SquareUp Sq. was their favorite. The beers will be sold at the brew pubs while supplies last with proceeds going to the SquareUp Fund. SquareUp Brew Fest was designed to attract over the day an ever changing crowd by offering three choices of unique beer, a variety of musical entertainment – polka, country, folk, rock and jazz – and several selections of food from downtown businesses and food vendors from the greater community. The bands and performers donated their talents to the event. The SquareUp Committee said the event was a success. Brew Fest organizers expressed their sincere thanks to the individuals, businesses, groups and organizations who participated and contributed with tremendous generosity and support. The SquareUp Campaign goal is $1 million dollars. The campaign ends July 1, 2010. Visit squareupwausau.org for information about contributing or purchasing a SquareUp paver brick for the Square. Is This Really a Challenge? It is pretty much peak season for all things growing. The summer crops are in, the fall crops are due any second now and so the farmers’ markets are just bursting with produce of all shapes, sizes and colors. Wausau now has three farmers markets each week, so there is no excuse for missing one. You can come down to the square tomorrow or down on River Drive Saturdays or Wednesdays. If you can’t make it to the famers markets, how about Downtown Grocery? Or maybe check out any number of local eateries that feature local foods, such as Alistair Deacon’s, The Wright Place on 6th, Sy-am Gardens on Thomas Street or many others you can find here on our sidebar. Eating locally this week is a piece of cake! But do those benefits have a cost? They must, a classical form of economics analysis, the TAANSTAAFL school, tells us. That is to say, “There ain’t no such thing as a free lunch.” To make something lower priced, something has to give. 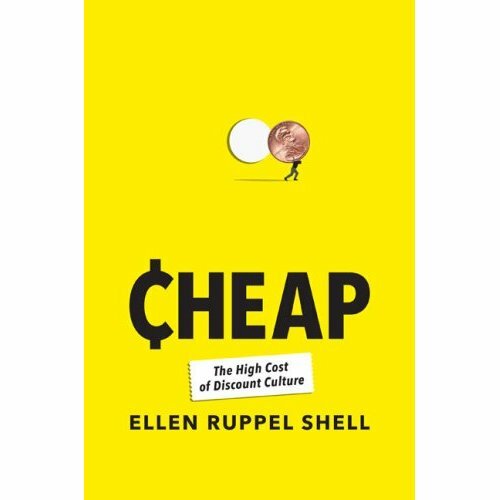 We would hope that it would be tremendous profit margins and over inflated executive pay, but as the book Cheap: The high cost of discount culture by Ellen Ruppel Shell points out over and over again, that is just not the case. What suffers is product quality, worker pay, and even human dignity. Low price doesn’t have to mean low quality, but most often it does, and not just the quality of the goods produced, but also the quality of life that results. And not just in those foreign lands where low wage workers crank out goods meant for shipping containers to fill our discount and dollar stores. As wages have stagnated in the US, even as productivity continues to climb, our happiness levels seem to have dropped, even as we have more and more to fill our shopping carts. The book does not necessarily provide grand solutions, but it is clear that buying quality products from quality people is part of that solution. P.S. Yes, I realize how ironic it is to link to Amazon for this book! P.S.S. I’m sure Janke Book Store would either have it in stock for would be happy to order it for you! The concept is simple (and so good) at Allister Deacon’s: artisanal eat-in or take away sandwiches, salads and soups with ingredients sourced from Moonshadow Farms, Stoney Acres Farms and the butchers at Country Fresh Meats. The atmosphere is uptown comforatble with salvaged architectural elements and original artwork. Try their chili or soup of the day or opt for updated classics like the A.D. Reuben (Corned Beef, sauerkraut, swiss cheese, and Russian Dressing with Baked Fries). Frittata (Oven-roasted champignon mushrooms, parsley and parmesean cheese with toast and local greens) or the Balsamic Roasted Portabello Sandwich (Grilled Moonshadow Farms summer squash, pesto amd mozzerella on housemade foccacia with local mixed greens). The food is hearty and flavorful. The menu may change based on seasonal availability of ingredients. While you’re waiting for your grub, take a seat on the comfy leather furniture and people watch. Or feast your eyes on their dessert and drink selection. Also serving an expanded breakfast menu including authenic New York bagels. The Peace Sculpture project is offering t-shirts to help fund Wausau’s own Peace Sculpture. T-Shirts can be purchased at Janke’s Book Store, Evolutions in Design, NTC Bookstore and the Farmer’s Market at Market Place Thursdays on the 400 Block in Downtown Wausau. The minimum donation per shirt is $12. Please note “Peace Sculpture Fund” in the memo portion of your check. Every animal owner has an adorable picture of their pet. Now’s the time to share it with the community and make your pet a star! The Humane Society of Marathon County is holding a photo contest to select the Cover Critters for their 2010 Pawtraits Calendar. All submitted photos will be displayed and judged through a bid-process with the top twelve winners selected as “Pets of the Month”. Additional winners will be used throughout the calendar. The photos will be displayed and the community will be able to vote for their favorites with a donation of $1.00 per vote. To enter, submit your pet photo, entry/order form and entry fee of $25.00 (each entry includes one free calendar) to: Calendar Contest, Humane Society of Marathon County, 7001 Packer Drive, Wausau, WI. 54401. Entry deadline is August 1, 2009. Sale price of the calendars will be $15.00 each and can be pre-ordered until September 1st. Pre-ordered calendars will receive free shipping. Chalk drawing by Megan Sichterman and Allie Reif.